Erin Miller | Galion Inquirer Galion’s Weston Rose looks to serve up an ace during Tuesday’s doubles matchup with partner Alec Dicus. Unfortunately, Rose and Dicus would fall in three sets to their Harding opponent as the Tigers suffered their first loss of the season; 4-1. GALION — On a busy afternoon in Heise Park on Tuesday, the Galion Tigers boys tennis team played host to an always tough, Mid-Ohio Athletic Conference foe in the likes of the Harding Presidents. With both teams entering the matchup undefeated, it would be the Presidents leaving town that way as they handed the Tigers their first loss of the season; 4-1. Freshman Matt Gimbel netted Galion’s only point on the afternoon, defeating his Harding opponent in first singles play; 7-6 (tiebreak, 9-7), 6-1. In second singles action, Chris Amick came up short in his three-hour battle, falling 3-6, 7-6 (tiebreak, 7-1), 4-6. Zach Grimes was defeated at third singles by a score of 2-6, 0-6. Over on the doubles side of the court, the first tandem of Weston Rose and Alec Dicus lost their three-set match; 6-1, 3-6, 1-6. Kodin West and Jamie Hollis fell at second doubles; 2-6, 0-6. Thursday’s match with the Clear Fork Colts in Lexington was postponed due to the inclement weather, but Galion is set to return to their home courts on Monday, April 8 where they will play host to another MOAC foe, the Buckeye Valley Barons. The following day, the Tigers will head to Shelby for a battle with the hosting Whippets. 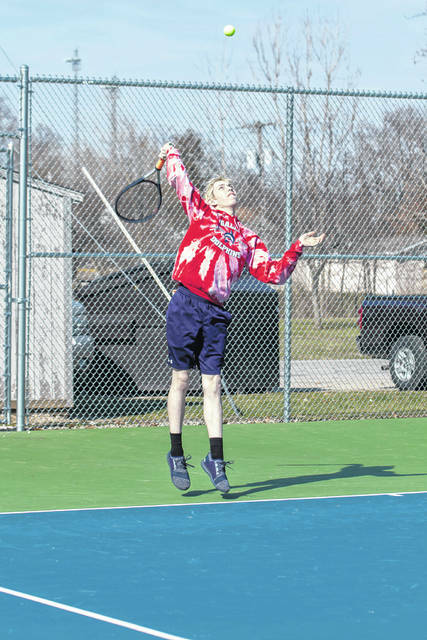 https://www.galioninquirer.com/wp-content/uploads/sites/38/2019/04/web1_IMG_7246.jpgErin Miller | Galion Inquirer Galion’s Weston Rose looks to serve up an ace during Tuesday’s doubles matchup with partner Alec Dicus. Unfortunately, Rose and Dicus would fall in three sets to their Harding opponent as the Tigers suffered their first loss of the season; 4-1.